The Dota 2 Competitive Hero Tier List for January 2019 includes data from The Chongqing Major, for a total of 140 games played during patch 7.20e. All heroes are arranged in five tiers based on their draft rate. The tiers are viewed as clusters of data, and each hero is placed in the one they are closer the most. The requisites for each tier never change. The goal is offering a neutral comparison that shows how the meta evolves over time. The win rate has no effect on the tiers, but is included for further info. The tiers depend only on drafts (picks + bans), and aren't affected either by the win rate of a hero, or by their performance in pub matches. This tier list contains all pro matches played from January 1st to 27th during patch 7.20e, including The Chongqing Major. All tables are responsive and sortable. If you are using a phone, turn it sideways for a full view. Otherwise, zoom in or click the grey area of each table to swipe and sort them. In the past year, trilanes and roamers completely disappeared from the game. We moved on a dual lane meta where both lanes (usually with a support and a core each) had to manage unaided the early laning phase. Looking at the lane compositions during The Chongqing Major, the trend is reverting. It is important to point out that not all the matches featured a classic trilane: things are not set in stone yet, and maybe the dual lane strategies will remain - it depends on both the lineups and the tactics adopted by the teams. There are several reasons behind this meta switch, but I believe the most predominant one is the change to the deny mechanic introduced by patch 7.20: denies no longer give the denier 25% XP. Before, a strong duo could beat three opponents thanks to the level advantage gained via denies, while now (even with an optimal lane strategy) it is not longer possible to acquire such a leverage. Eventually, two heroes are fated to lose versus three. I remember that pubs required months to adapt to the dual lanes (particularly at low and average ranks), so now I am wondering how much time we will have to wait before trilanes will become common again at Archon and Legend. If trilanes (or duos with a dedicated roamer) become popular again in the easy lane, then the offlaner will be forced to play solo. Strong and reliable offlaners who are able to survive on their own, secure gold in the laning stage, upset the enemy carry, and exploit the adjacent jungle in the dead times, have been summoned back into the game. The solo offlaner has been a thing also in the past, but in this particular meta you absolutely do not want greedy offlaners: the best choices are heroes who bring utility to the team and do their job even with the minimum amount of items. We are playing in a very combative meta where lots of fights take place in the first 10 minutes of the match, so the offlaner must be ready to leave their lane at any time and contribute to team fights and ganks. They must have abilities that can make the difference in an early clash. I have decided to discuss briefly about Enigma as many Dota 2 players are wondering why he is not picked more in the current meta. 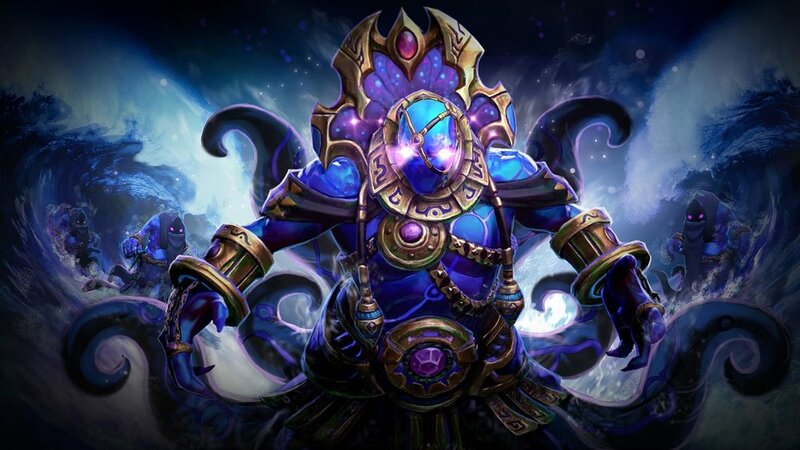 Actually, Enigma is a very solid offlaner who - thanks to the eidolons - is able to deal versus most opponents, harass and farm creeps, and comeback from the worst lanes by exploiting the extra gold in the jungle (he is one of the most efficient junglers in the game). He is also a great resource in team fights, both for Black Hole and Midnight Pulse. The latter deals pure damage based on a percentage of the max HP of the targets affected, so it is particularly powerful in the late game and against heroes with lots of health points. Enigma is not a popular pick because he is a greedy hero and requires time to reach his peak. Black Hole is an amazing spell in team fight, but the long cooldown (200 and 180 seconds at the first two levels) makes it a poor choice in a meta with several clashes. Potentially, Enigma can opt for the 15% cooldown reduction talent, but he still needs to maximize the skill before the cooldown decreases below 150 seconds. He also requires items, such as the Black King Bar, or the opponents might stop his initiation with a single stun or silence. Overall, he needs too much time to become really troublesome, while now we need heroes able to make a big difference from the early-mid game. During The Chongqing Major, Tidehunter has been played as a solo hero both in the off and the safe lane (those games featured an offensive trio in the hard lane). In a limited amount of matches, we also had a mid core Tidehunter. There are several reasons behind his success in the current meta. Reducing the armor has a bigger impact on the amount of damage inflicted, so heroes and items with this ability are well-welcomed as they boost the physical damage of the whole team. This tactic is particularly efficient in the early and mid game because stacking armor requires time (levels) and gold (items). Tidehunter has Gush, a single-target spell that reduces the armor of the enemy affected by 4/5/6/7 (the level 20 talent increases its effect by 5). On top of that, many players added the Medallion of Courage to their item build, which reduces the armor of the target by 7 for only 1,175 gold. Of course, also the opponents might follow the same strategy, but Tidehunter has a handy tool to counter partially the extra damage: Anchor Smash reduces the base damage of all the targets (375 AoE range) by 45%/50%/55%/60%, and the effect could even be boosted by 25% with the level 15 talent. 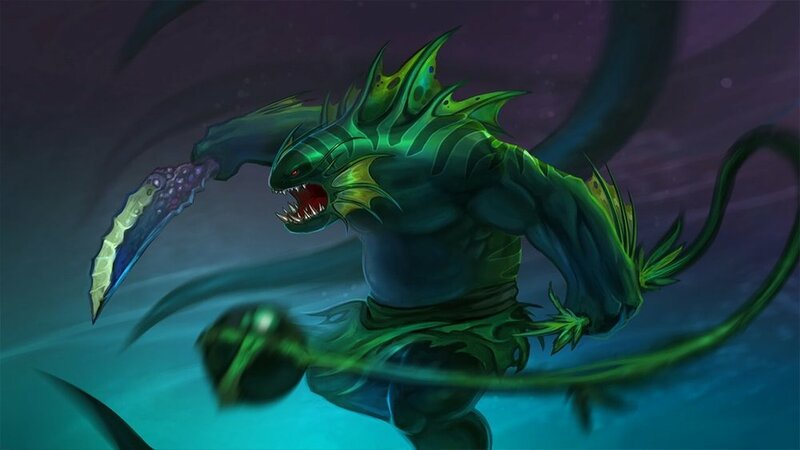 Tidehunter is one of the hardest heroes to kill during the early game because of the damage reduction provided by Anchor Smash and the in-built damage block via Kraken Shell. Moreover, he has 695 HP at level one and enjoys a huge 3.3 strength gain per level. I would like to share with you a possible tactic: start the match with the Stout Shield. Level 1 Kraken Shell blocks 12 damage with a 100% proc chance, while the Stout Shield blocks 20 damage with a 50% proc chance. This item doesn’t stack with your passive, and becomes useless once you level it up, but in might be useful in the early levels to receive a bit less damage from 50% of the attacks. Honestly, I am not sure if this strategy is really worth the 200 gold cost as pro players bought the Stout Shield on Tidehunter only in two games during the whole month, but I still suggest to give it a try. Depending on your games, your rank, and your own skills, the extra damage block might save your life in a couple of early game encounters. Note: Of course, this tactic is viable only if you decide to max out Anchor Smash before spending a second point into Kraken Shell. If compared to Enigma’s Black Hole (we discussed about it previously), Ravage has a lower cooldown (150 seconds at all levels) and it is extremely easier to land in the early and mid game due to the huge radius (it is viable in many fights even if you still miss the Blink Dagger). This ultimate loses its effectiveness in the late game because it doesn’t pierce spell immunity, but it is still very powerful in all the team fights during the mid game, when it matters the most in this fast-paced meta. Tidehunter is also able to deal a considerable amount of damage via Anchor Smash. 7.20 reworked the skill: now the hero attacks instantly all the enemies within range. The attacks have true strike, inflict physical damage (as the past one), have a 45/90/135/180 bonus attack damage, and trigger attack modifiers (except cleave). In some games during The Chongqing Major, the players abused this skill with a proper itemization. For example, Team Liquid’s Lasse Aukusti “MATUMBAMAN” Urpalainen scored 12-4-21 as Tidehunter in the mid lane. He bought Vladmir’s Offering, Blink Dagger, Desolator, Black King Bar, Daedalus, and Boots of Travel. Every time he used Anchor Smash in the middle of a team fight, he healed himself with the lifesteal provided by the Vladimir’s Offering. Thanks to Kraken Shell (damage block and debuff removal) and Tidehunter’s massive health pool (2,472 HP at level 25 without items), he wasn’t an easy target to kill. Moreover, he also had the Black King Bar for magic immunity. Anchor Smash applied the Desolator’s Corruption (7 armor reduction) to all the enemies hit (he can’t miss due to True Strike). Thanks to his item build (Daedalus) and the extra 250 damage from the level 25 talent, he could inflict heavy critical AoE damage. Tidehunter turned into Kunkka :P.
Team Liquid used a niche build in that match. You can’t expect to have the core position with Tidehunter in all your pub games. The Vladimir’s Offering (33) and the Blink Dagger (32) have been the most popular items picked by pro players during the month. They are followed by the Bracer (23) and the Soul Ring (12). Generally, a couple of Bracers in the early game will drastically boost your survivability and damage, but you can’t always farm them at the right time as a solo laner. Afterwards, we find the Medallion of Courage (8), the Pipe of Insight (7), and the Mekansm (7). Overall, the most bought items are pretty standard: they focus on survivability and buffs for Tidehunter and his team. Regarding the boots, the Arcane Boots (14) and the Phase Boots (14) have been the most popular choices, while the Power Treads have been picked in only 6 games. In tier 4 and 5 we find all the situational heroes. They are strong when paired with others, or against specific lineups. These heroes aren't bad, they just don't work in every game, so the pick and ban rates aren't outstanding. The Dota 2 Competitive Hero Tier List for July 2018 includes data from 7.18 only, for a total of 98 games. All heroes are split in five groups. The Dota 2 Competitive Hero Tier List for September 2018 includes data from 7.19b and 7.19c, for a total of 371 games. All heroes are split in five groups. The Dota 2 Competitive Hero Tier List for November 2018 includes data from 7.20 to 7.20c, for a total of 234 games. All heroes are split in five groups. The Dota 2 Competitive Hero Tier List for March 2019 includes data from DreamLeague Season 11 Major, for a total of 290 games played during patch 7.21c.